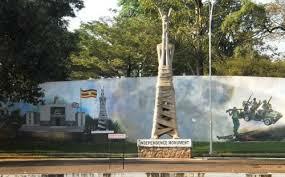 It is 9th October, the Day when Uganda attained her independence from colonial rule. Today the country marks 51 years of independence and the national celebrations are to be held in the western district of Rukungiri. Rukungiri is the home district of former Forum for Democratic Change leader Kiiza Besigye who is also expected to be in attendance. Mozambique’s President Armando Guebuza is in the country as guest at the celebrations to be presided over by President Yoweri Museveni. This year’s national Independence Day celebrations are to be held under the theme “Re-energizing Uganda’s Development Potential: Middle Income Status Achievable”. Anti-corruption activists are not taking part in the Independence Day celebrations. The executive director Anti-corruption Coalition Uganda Cissy Kagaba says independence cannot be celebrated when many Ugandans are still grappling with poverty and disease. Kagaba notes that tax payers’ money is still being misused by some government officials, denying Ugandans their right to basic necessities. Kagaba adds that they have resolved to mourn rather than celebrate.